Enlance theme is responsive design ready using fluid layout by the most popular responsive framework, Twitter Bootstrap. Enlance layout will adjust on any various screen’s devices (desktop, iPad, iPhone or any other smartphone). If you want to customize the theme but don’t want to lose all the changes when you update the theme, you can easily create a child theme. The Enlance theme fully supports for child theme works based on WordPress recommendation. Do you want your site speaks your languange? Enlance theme is translation ready. Just simply translating the .po file provided in the theme package (in the ‘language’ directory) using the PO Editor. Since jQuery invention and large use of it. jQuery is very powerful script building attractive slider. Enlance theme has very attractive slider which will catch your customers attention quickly by serving links in big image thumbnail and smooth sliding animation. 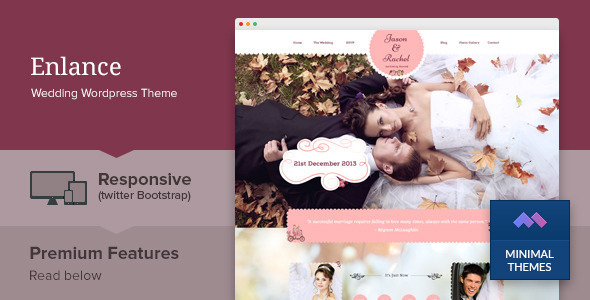 Enlance theme build under Twitter Bootstrap responsive framework with 1170px width of container. You can define your own footer text or copyright notice in site’s footer very easy via theme options. Enlance theme has special content (Sliders, Quotes, Galleries, Event, RSVP post type) in different group of posts. It makes your site has rich content. Visitors can contact you directly via contact form. You do not need to use any plugin to make a contact form that works. Enlance theme has already had this for you. SEO is one of the important points for your site visibility in search result in search Engine. Our theme is build using SEO friendly approach. We put heading tag properly, implement alt tag for images, and etc. SEO feature is a good approach for site recognition in the search engine. You can set up meta description and meta keywords easily from Theme Options, then your site is SEO friendly. It enables you to manage your site with no pain. Some informations displayed in the front-page are managed from here. Here you can set up the custom logo, favicon, category news, font family, SEO settings, analytics code, Google Map Address, etc. Enlance theme package includes an XML dummy content. After installation you can import it as an example. So will easy to create your own content. Enlance theme comes with a well documented theme documentation. It is a help resource for you to manage your website easily using Enlance theme and make your site looks similar with our demo site. We provide lifetime updates and support via direct email address http://support.puriwp.com . Feel free to make a request. We do replying all requests and trying to help everyone with what we can. Do you have your own feature to add? Make a request to us here: http://support.puriwp.com And we provide a paid customization services to for all of our themes/templates. Please send an email to services@puriwp.com if you have some requests in mind.